Thornbury Ontario, Canada / Sheffield UK - March 25, 2014 - As announced yesterday Scottish-born / Canadian resident Ben Young is delighted to announce that he will contest the British Superbike 1000cc Superstock Championship aboard the #40 GR Motosport prepared Team WD-40 Kawasaki ZX-10R in the highly competitive 2014 MCE Insurance British Superbike Championships (BSB). Young is honoured to continue his long-term partnership with Tim Hortons (Sudbury) franchisee Gilles Bolduc for the third straight year. Not only will 2014 be a special year for Young, Canadian coffee icon Tim Hortons will be celebrating their 50th anniversary as well. Proudly sporting the Tim Hortons brand Young has been honing his craft racing throughout the United States in the AMA Pro Road Racing’s Daytona Sportbike class since 2011. 2013 was his best year to-date, highlighted at the opening round by an 8th place finish last March in the prestigious Daytona 200. Residing in Canada since 2007, Young is no stranger to racing in the UK. He started off competing in the Scottish Minimoto Championships at the age of five then progressed to compete in the Scottish and British 125GP Championships. Although this is a home coming of sorts for Young, the resident of Thornbury, Ontario Canada is looking forward the new challenge of riding the 1000cc machine in the British Superbike Superstock class. Young is also honoured to continue his long-term partnerships with Aria Helmets and Scot-build Developments Inc. in his new venture abroad. He will continue to be outfitted with the latest AXO America Indy Leather Race Suits, KK4-R Gloves and Aragon Race Boots. 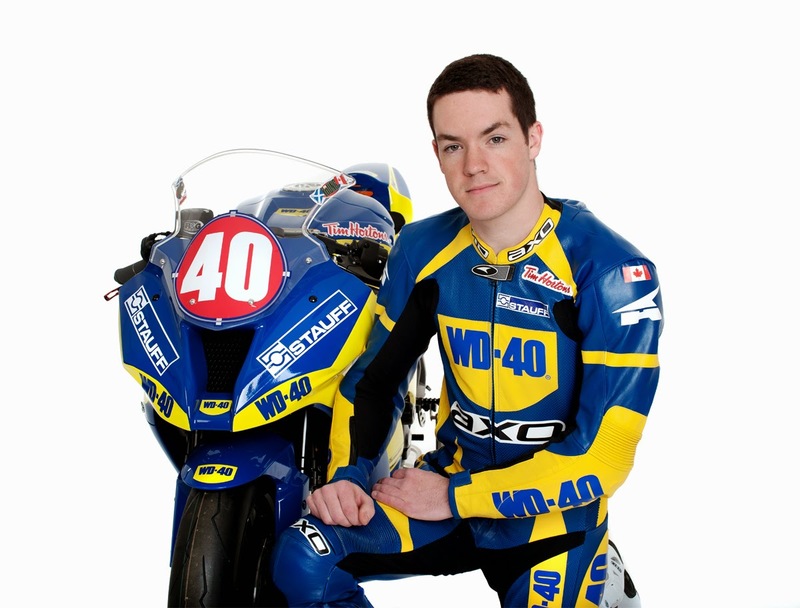 Young’s Team WD-40 teammates include: #7 Barry Burrell (Superbike) and #40 Tarran Mackenzie (Superstock 600). Brent Gladwin: “We’re delighted to have Ben join Team WD-40 with Tommy’s recommendation and I can’t wait to get the season started. We were impressed with Ben’s 2013 AMA Daytona Sportbike season especially his 8th place finish in last year’s Daytona 200. The 200 is a tough race to do well in and I believe he was the top true privateer. He has a natural talent and has obviously worked extremely hard to hone that talent; I’m pleased to have signed him”.